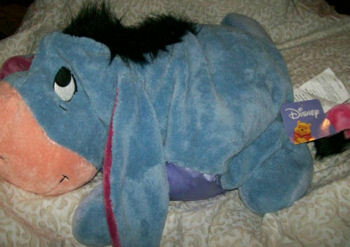 I am looking for a Disney Microbead Mushable Eeyore. He measures about 24 inches by 13 inches wide. Also he has a satin like belly, and it almost looks like his eyes are crossed at the top. I’m looking for the Eeyore for my senior Chihuahua, Peanut. I bought one at Costco for him about 5 years ago, and he’s been attached to him ever since. Eeyore has seen better days and isn’t in the best condition. I’ve patched up rips and tears and tried to surface clean him through the years, but there’s only so much I can do. I’ve been trying to find a new one or a used one in great condition for my little dog. He sleeps with Eeyore every night and tries to drag it around the house, so he can be close to him. I’d appreciate your help in locating one. I have a 24″L x 23″W (by his feet) 13″W (by his head). His made by Fisher Price. He also talks. 250830056897 – HURRY! ALMOST GONE! Thanks, Brieanna! I sent this to both of them, but I was late in getting it off. Maybe one of them will see it in time. I’m still looking for the Disney Mushables Microbead Eeyore. There’s a used one on ebay selling for $59.99 but it’s too expensive especially since I only paid $14.99 for a brand new one at least 5 yrs ago. I have one you’re welcome to have. All I ask is that you pay for shipping.